Accessories: Accompanied by Grand Seiko guarantee, additional Certificate, original hang tag, product literature, fitted presentation box and outer packaging. Sleek, hefty and subtly impressive, reference SBGW039 was made in celebration of the 130th anniversary of Grand Seiko. The present watch is one of 130 pieces cased in platinum and is instantly recognizable due to its non-blued silvered seconds hands. In addition to the platinum version, Grand Seiko also released 1300 pieces in steel and 130 pieces in yellow gold in 2011 to celebrate the occasion. 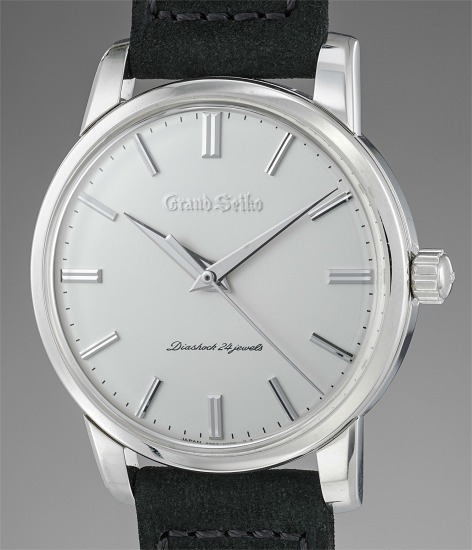 The trio was a remake of the very first Grand Seiko model - reference 3180. Sharing similar case proportions and a dial design, reference SBGW039 references its past, while featuring a modern caliber 9S64 with a three day power reserve. Furthermore, the crystal changed from plexi, to sapphire crystal. The case, movement, dial and hands are all executed and finished to the highest degree and quality - a defining characteristic of Grand Seiko. Furthermore, this watch is accompanied by its guarantee, additional Certificate, original hang tag, product literature, fitted presentation box and outer packaging.